It is set in Damascus Syria in more peaceful times. Nadine Kaadan’s narrative and vivid colourful illustrations bring the beautiful cobbled streets of this ancient city to life. You almost feel like you are there. 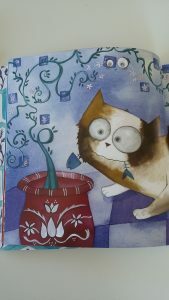 I chose it from Lantana publishing books because it features a cat and ‘something that grows’, both of which my son was really interested in at the time, and still is. 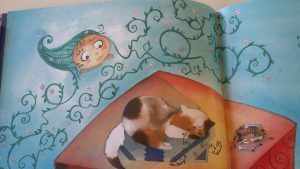 The story is about a cat called Haroun. who loves his life in the courtyards of Damascus. The only thing he doesn’t like is the jasmine plants, that are outside everyone’s front door, because they make him sneeze. One day Haroun tries to get rid of the sweet jasmine smell by putting fish and chicken bones In the Jasmine pots. However, the Jasmine Spirit takes revenge in her own creative and humorous way. And Haroun learns that the jasmine plan was more important to others than he thought it was. A story that grows with your child is one of my favourite kind of picture books and this is certainly one of them. My son seems to have empathy with the character of Haroun. Being cat crazy certainly helps but so does the great story and pictures. 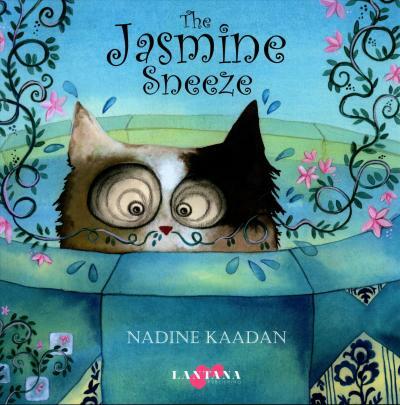 I remember when we first started reading it how he felt sad for Haroun when Jasmine started to grow out of his nose. It is fascinating to see how the book has grown with him. When I asked him this week which were his favourite pictures, one of them is below. 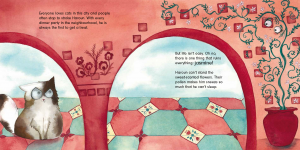 He also likes all the jasmine plant illustrations that are intertwined with the story. There are several layers to this story and these intertwine with the central message. Such as: the importance of the jasmine plant to each family in the neighbourhood where Haroun lives and the idea of a plant that has a spirit. 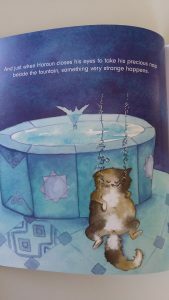 Through the narrative and colourful illustrations, the reader is introduced to the sights and sounds of a ‘different’ place and culture. I highly recommend this story for children aged 4 to 10 years. You can learn more about Lantana Publishing here. Lantana publishing has created some great free resources for this book.